The White Sands National Monument is a sight to behold! Everywhere you turn, blinding bright white gypsum crystal sand and dunes are all you can see - a stark contrast to the mountains and southwest vibe surrounding the site. Being immersed in that sea of white feels like being in a Dahli painting: completely surreal. What makes the scene so dreamy is the fact that gypsum is rarely ever seen in sand form because it is water soluble. But since the Tularosa Basin it is located in has no outlet to the sea, the rain and snowmelt from the surrounding San Andres and Sacramento Mountains is trapped in the basin, drying out, and leaving the gypsum in a crystalline form. Price: It is a $5 entrance fee to get in if you do not have an annual National Parks pass. There are discounts for seniors and military, and your pass is good for 7 days. Weather: Summer temperatures exceed 100 degrees Fahrenheit. Be prepared with plenty of water and sun protection. Desert weather can also be unpredictable - make sure to check before you go. Activities: Bring along a sled (or a DIY one) to shred the slopes, check out the horse trails, or go for a hike! Back-country camping is also available. Transportation: Drive through the scenic 16 mile round trip of the park, or better yet, trade the engine in for 2 wheels and take in the sights on your bike (weather permitting). Fun fact: In addition to the U.S. military using the basin for scientific research and technological development, missile testing is also done on the adjacent White Sands Missile Range. This sometimes means road closures though, so plan ahead. Timing: Timing is everything! During the hot afternoon the park is blindingly white and the sky is brilliantly vibrant. At sunset, the sherbet colors of the sky bounce of the sheet of white sand. At night the desert's thin atmosphere makes for star gazing that is literally out of this world! Nature and Wildlife: Although the desert may look desolate, the unique ecosystem is actually brimming with life upon closer inspection. Hike through the park and keep your eyes peeled for lizards (Bleached Earless Lizard in particular), small mice (like the white Apache Pocket Mouse), bleached species of insects (like the Sand-Treader Camel Cricket and Sand Wolf Spider), and desert fauna including cacti, yucca, and desert shrubs. Before you scamper out of the hot basin, make sure to check out The Ancient Petroglyphs at Three Rivers and The Valley of Fires right nearby. 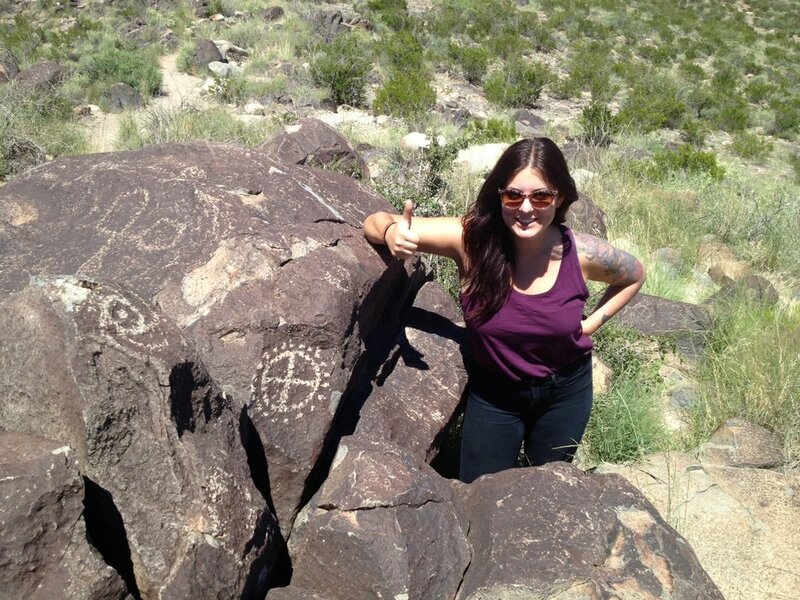 The Ancient Petroglyphs at Three Rivers is a unique historical site thought to be the product of the Jornada Mogollon people from 1000-1400 AD. The mysterious illustrations have a bit of that New Mexico alien flare to them (if you are believer) illustrating things like a 6-fingered hand and flying saucer like objects. The Valley of Fires is an ancient basalt lava spill through the basin that originated from several nearby volcanoes. Part of an extensive flow that is 165 feet thick and over 45 miles long, all you can see in any direction is more of the lava badlands. It's shocking that nature still manages to peek out as twisted cacti and yucca make their way through the lava cracks. After enjoying New Mexico's enchantments, we recommend camping at Sleepy Grass Campground in the Lincoln National Forest in Cloudcroft, NM. Sleepy Grass is heavily wooded and cool in comparison to the hot temperatures that lay in the desert below. It’s amazing heading from 100 degree desert weather, up to crisp 60 degree mountain air. The campground is serene, the sites are private, and there is hiking within the park. It is also a very special site to us personally, and one of our all time favorites to stay at! Have you made a trip to White Sands National Monument? We would love to hear what your favorite things to do at the park are!